Guitarist Ian O’Neil is quick to point out that he and his bandmates Chris Ryan and Dennis Ryan, John McCauley, and Rob Crowell. have taken the time to give these classic records their due, so don’t worry about them unintentionally massacring “Satellite of Love,” or stumbling through the ephemeral hooks of “Welcome to the Working Week.” After all, their “Deervana” act is so convincing that Dave Grohl asked McCauley to fill in for Kurt Cobain during Nirvana’s reunion at St. Vitus. Deer Tick’s residency at the Bowl will take place from December 26 to 31 and they’ll be accompanied by many a notable rock & roll superhero, from The Replacements’ Tommy Stinson to Sharon Van Etten to Taylor Goldsmith from Dawes (see the full lineup here). The final set, on New Year’s Eve, will be completely chosen by their fans via crowdsourcing. And the entire week of performance will be live-streamed via Yahooscreen, so you can watch from the comfort of your own 6-by-8-foot bedroom, if you feel so inclined. We asked the band a few questions about the cavalcade of covers. What’s the fascination with playing cover sets? Is it just a way to spice up the monotony of playing your own songs over and over? Ian: I can’t speak for everyone but I think it’s important to acknowledge and celebrate the music and people responsible for helping us to do what we do. Anybody who’s afraid of celebrating their influences is probably just insecure about their place in the lineage of songs and performance. Do you ever think that when you cover a classic record in its entirety that you might massacre or it, or that you won’t be able to do it justice? Ian: We could quite easily royally screw up all of these records, but we’ve been taking a lot of time and care and taking this event pretty seriously. You guys kind of shirk the “country” label, but you’ve been known to cover John Prine and Hank Williams. How did you discover that old-timey stuff? As a band from New England, which is pretty culturally different from the south, how did you get into that stuff? Ian: It’d be a pretty strange world if people only played their regional genres of music. Those days have been gone for a long time. What’s it like to reach the decade mark playing in the same band? Did you ever think you’d be around this long? Chris: Just feels like yesterday that we played our first show. Probably. You’re covering Transformer, Q: Are We Not Men? 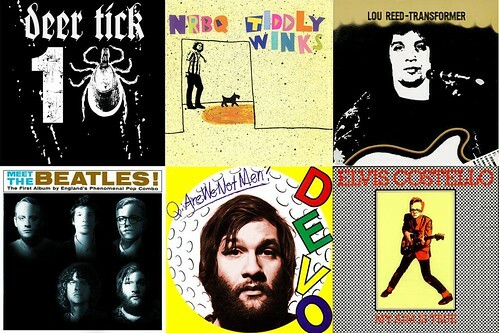 A: We Are Devo!, Meet the Beatles and other classic records at Brooklyn Bowl. How have all of these records affected your lives personally and musically? Ian: These are some of the records that keep us in touch with why we play music. I read that Dave Grohl approached you guys about playing a Nirvana cover set with him on drums. Is that ever going to happen? Ian: That’s unfortunately just a rumor. You crowd-sourced your set list from fans for your culminating set on New Years at the Bowl. Did their selections surprise you at all? Ian: Not really. Its nice that that many people care enough to give their opinion, though. I do think the direct participation of the audience will create a sense of belonging and community that is rare at shows of this capacity. I’m happy for them and for us. Is there anything we don’t already know about your Brooklyn Bowl performance? Ya’ll got some surprises in the bag? John: Maybe we’ll lock all the bathroom doors.